Once the mechanical components were working well, the next step is making it wearable. The original idea was to make it as a sleeve for the lower arm, so a pattern needed to be developed. One common method used by people who make their own costumes, cosplayers, uses a thin plastic and tape. First step is wrap and secure plastic around the area a pattern is wanted. The plastic can be saran wrap, a grocery sack, trash bag, or anything similar. Covering the plastic in between the taped boarders, making sure to keep the tape as smooth as possible, is the next task. Carefully remove with scissors, trim off the excess plastic around the edges, and cut the piece in half. Using one of the halves, trace the shape out on a piece of scrap card board. Then draw a second line half inch away, all the way around the shape for a seam allowance. This pattern is then used to cut out the needed layers of fabric that will house all the components for the second prototype. As with all wearable technology projects I’ve worked on, power is one of the big challenges. There are all sorts of really cool things you can make, but as soon as your system requires 12V to run, it becomes unwieldy and not really wearable unless it’s a backpack to start with. In the past, I have been very pleased with Sparkfun’s 5V rechargeable power bank for both function and affordability. It is compact and light weight, comes with a cord to power your project and recharge the battery. Additionally, the power button on the battery can double as an on/off switch for the entire project. The big problem with the initial prototype is that the solenoid valves needed 12V to open and close. With a bit of digging and research, I was able to find some 5V solenoids as well as a mini air pump, and ordered some for the next iteration of this project. For my initial prototype and testing, I was using an Arduino Uno and a Sparkfun RedBoard for the micro controller, however, I’m going to switch to a much smaller ProMicro board now that the code has been tested. Using my concept sketch, I created a digital version of the design in Illustrator. With the laser cutter and assistance from and lab mate, we cut out a piece of non-adhering paper to sandwich between the heat sealable nylon. After fusing the nylon with a heat press, but leaving one side open, the small valves were installed, and then the last side sealed. This wasn’t quit the dramatic shape change I was hoping for, but not too bad for a first try. The next step was to hook it up to a system with tubes, an air pump and small solenoid valves. Even with all the components wired to a bread board, all the components, except for power, for this project fit into a small flat box. Still a bit big to wear on your arm, but a few adjustments and I think it will work. The prototype worked pretty well. The level tracking function worked, and partially inflated the correct pouches. Power! The current system needs different power sources to run the valves, pump, and microcontroller. Additionally, a 12V battery pack will certainly interfere with the “wearability” of the device. Shape changing is too subtle. Need to make the pouches bigger, or change the angle of the fused shape in middle of pouches, or separate the pouches and make them individual, or rewrite code so there is more air pressure flowing into each pouch, or some combination of these options. Material. After running the test code for a while, some of the pouches started to leak and wouldn’t inflate all the way. I’d also like to look into getting plastic fixtures for attaching the pump to the pouches to lower weight and cost. Working in the “ThingLab” over the summer on a couple different projects involving haptic control interfaces and pneumatics inspired the development of this one. According to Google, the definition of haptic is: “relating to the sense of touch, in particular relating to the perception and manipulation of objects using the senses of touch and proprioception.” In controlling the many systems we interact with daily, there are situations where visual faculties are occupied, obscured, or permanently impaired so discovery and control are delegated to our hands. As a first attempt, I thought a simple controller defining levels with up and down selector pads would be useful and have broad application(volume, fan speed, etc…). The outer forearm seemed like a good place to attach it to a human body as there will be minimal interference during activity and can be worn over clothing if needed. 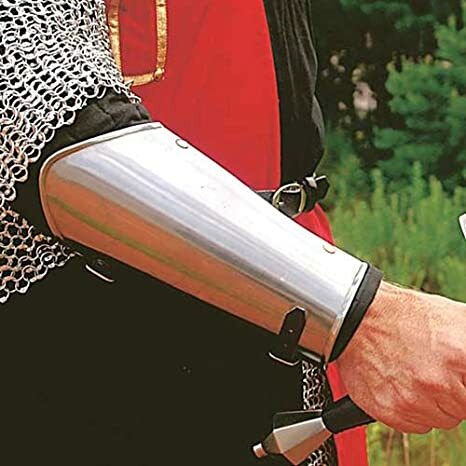 A Vambrace in terms of armor. Here is a first concept sketch of what I’m thinking. Some air-tight pouches hooked up to tubing that connects to a tiny pump and some sensors embedded under the (+) and (-) to act as control buttons.